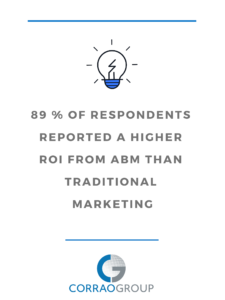 Did you know that 89% of respondents reported a higher ROI from ABM (Account-Based Marketing) than traditional marketing initiatives (ITSMA)? While ABM is a strategy best suited for long term growth and potential, new technology – specifically, AI (Artificial Intelligence) could be the critical difference in getting more leads and maximizing your ROI. Account-Based Marketing tactics are improving fast, and with the help of technology, it is becoming a marketing plan that every B2B company should explore. Imagine being able to recognize a target account the moment they are doing their initial research. Today that is all made possible because of artificial intelligence, and AI is transforming the game in 2019 because of its ability to provide real-time feedback. AI can synthesize through millions of analytics in real time, delivering a list of potential targets. Naturally, this will improve identification rates, which in turn could make for better results for your company. Furthermore, it is now easier for companies to understand the early signals in regards to what an account is not only writing about but what they are searching for. In other words, AI is producing real-time intent, which is getting those early signals about what an account is searching for on search engines. This becomes an important step in the Account-Based Marketing process because the ultimate goal is to get them the moment they start their initial research into what their problems are and the solutions that are offered. Additionally, AI is also improving account engagement which is following click behavior to identify in real time who (person, company) is on your website, while also recommending content that is relevant to their specific needs. Improving account engagement allows marketers to know who was on their company’s website and what they were looking at (issues they have). This provides sales and marketing to have faster conversion rates because they are already sending their hyper-personalized content to that specific person. Artificial Intelligence works so fast behind the scenes that it allows the sales and marketing teams to work together to best identify the company’s pain points and provide them with solutions to their problems. Ultimately, the old ways of marketing that manually crunched numbers over a designated period are over; AI immediately processes the data and allows marketers to sit back and focus on the bigger picture. Leveraging the ever-changing technology can lead to quicker conversion rates for your company. If you would like to learn more about the importance of artificial intelligence and account-based marketing tactics, please contact us. 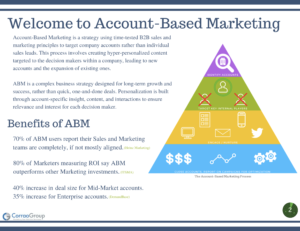 A recent study by Alterra Group has found that, “97% of marketers surveyed said ABM had higher ROI than other marketing activities.” Account-Based Marketing is a strategy using B2B sales and marketing principles to target company accounts. It is designed for long-term growth, rather than quick short deals. Based on the ability to send hyper-personalized content to targeted decision makers, Account-Based Marketing tactics are a strategy that if it is managed right, can maximize your ROI over time. Where do I get the budget for ABM? 3. How do I get my sales and marketing team to work together? A recent study by SiriusDecisions has found that “B2B organizations with tightly aligned sales and marketing operations achieved 24% faster three-year revenue growth and 27% faster three-year profit growth.” One of the best ways to have the sales and marketing teams work together are weekly “Smarketing” meetings. These meetings help identify valuable accounts, goals, and strategy. Smarketing meetings allow the alignment of marketing and sales so that it puts your company in the best spot to succeed. In addition to weekly meetings, there are one on one meetings with the sales rep and marketer responsible for the account. These sessions help build the best strategy for going after the company’s pain points and goals. The sales and marketing team being disconnected could be the critical difference between closing a deal or not. 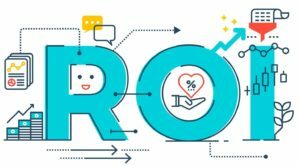 Where’s my ROI with Account-Based Marketing Tactics? Account-Based Marketing tactics require patience as it is more based upon long-term growth rather than short term. It is the alignment of sales and marketing that will be the critical difference between getting your ROI or not. ABM will give you qualified leads. However, it is up to these two teams being able to pick the more qualified leads which best suits your ICP (Ideal Customer Profile). ABM is going to take a while to get going, but with patience, it will be well worth the investment. Please visit Where’s my Account-Based Marketing ROI for a full review on this question, or visit our website to learn more on how to maximize your Salesforce Investment.